WOW!!! It’s officially one week into our tour and the time is going way too fast. 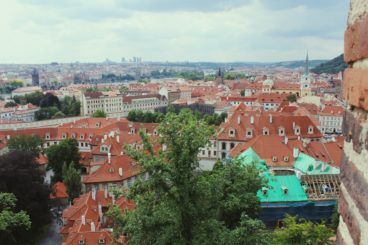 Today was our last day in Prague which means we have visited ⅗ of the cities on the tour. Most people on the tour are incredibly upset that today was our last day in Prague. Everyone has absolutely fallen in love with the city. Its winding cobblestone streets, beautiful architecture, stunning sunsets, and magnificent bridges have been a focal point of our visit and we wouldn’t trade our time spent in Prague for the world. Today has been yet another crazy day complete with a walking tour, flashmob, and boatride. Let’s begin with the walking tour. Our walking tour was of the Prague Castle, the largest castle complex in the world. The Prague Castle used to house the royalty of Prague including Kings and Princes. Nowadays it houses the president and their family. The tour began with us walking through the gates of the castle which are completely open to the public, as long as you go through security. The gates lie beyond a deep moat which is known as “Deer Moat” because lots of deer used to get trapped in the bottom of the moat unable to escape. “Deer Moat” has been transformed into a beautiful public park over the past ten years and is used daily by the public for picnics, walks, and even suntanning. The two guards standing outside the castle on opposing sides of the gates have new uniforms designed by the same artists who designed the costumes for the movie Amadeus, a documentary about Mozart’s life and the music he created and inspired. Castle guards change every hour on the hour. Our tour was lucky enough to see the procession of this switch when the new guards exited their quarters and walked through the square out of the gates and when the old guards came into the square and to their quarters. This was very cool for me to watch as I come from a military family and appreciate the skill and regime it takes to be able to have such discipline and synchronization with those around me. After we took a brief stop in the square to allow our tour guides to buy tickets, we headed towards St. Vitus Cathedral. You may recognize St. Vitus from the Christmas Carol which describes him as the good king. Fun fact: St. Vitus was never a king, only a prince. The Cathedral was built in two different eras. The back half of the cathedral was built in the fourteenth century and has a Gothic style of architecture. The front half of the cathedral was built in the early 19th century and attempted to keep the Gothic architecture, ultimately the builders of that time could not replicate the intricacies and true difficulty of the Gothic art to its true meaning but kept some elements especially on the outside of the church. The inside of the church gleams and glows with the colors of the stained glass windows. Each of which were created in the 19th century. In the “old chapel” the windows were replaced in the 19th century in order to keep the colors shining through as uniform as possible. Beautiful blues, purples, yellows, greens, and reds shone into the church creating the most glorious waltz on the walls and floors. There were several monuments within the church dedicated to saints. Most notable of these monuments was the tomb of Saint John of Nepomuk. He is buried in a tomb which is entirely made out of silver and weighs over two tons. Beautiful intricacies including crosses, cherubs, angels, God, drapery, and the sun dance around the coffin and shine as the sun comes through the stained glass windows. The most interesting piece of information about this tomb is that Saint John did nothing extraordinary to deserve this tomb, according to our tour guide, he just really liked silver. Our tour continued outside of the cathedral and into an estate building where meetings of past kings, inaugurations of present-day presidents, and even jousting tournaments have taken place. Inside the estate building, exact replicas of the Habsburg crown and staff are enclosed in a glass chamber. The crown and staff are made of 22k gold and each are covered in 98 jewels. The room where these treasures are held is also home to four paintings of Habsburg nobility and a throne where each of the royalty depicted in the portraits once sat. The next location on our tour was Golden Lane. The street used to be named after the royalty’s alchemists as Alchemist Alley. However, alchemists never worked or lived on this street. Golden Lane consists of small houses, painted in bright colors in the 1950s. The street originally had houses on both sides, but one side was demolished in the 19th century. Many of the houses are now souvenir shops. House number 22 is a special house among those on Golden Lane. It used to belong to the sister of writer Franz Kafka, who used this house to write for approximately two years between 1916 and 1917. After the walking tour of the castle, we made our way back to Old City Center where we were released for our two hour lunch break. My group of friends of course got gelato. Again, we like to stick to a routine. Sorry if this is repetitive. We met back in our groups in the Old City Center for 2:00 PM. There was another group of singers there from Poland who we made friends with and had a dance battle / sing-a-long / flashmob with. They were very kind and we were even able to sing Leonard Cohen’s Hallelujah together! Music truly is the universal language. Once we were all accounted for, we walked back to the hotel, had some free time, and got ready for dinner. We took tour buses down to the Vltava river and crossed a bridge on foot. We were then led to a beautiful boat where we boarded and began a wonderful dinner-cruise on the Vltava. There was music, great food, and laughter. Honestly, what else can you expect from a MYO tour?! The cruise ended and we were split into two groups by personal preference. Some walked through the streets of Prague and back to our hotel, but most had had enough walking and chose to take the buses back to the hotel. We, again, had some downtime before room check and some friend groups really made the most of it. Shoutout to Trevor, Elin, and the amazing mac & cheese which was delivered right to my door hot and ready for me to eat! Thank you all for reading about yet another amazing day in Europe with MYO 2018! Can’t wait to travel to yet another beautiful city tomorrow… Vienna you don’t even know what craziness is coming for you.